As I was taking my desk picture yesterday afternoon and preparing this post for What's On Your Workdesk Wednesday 513 my mind wandered to last week. 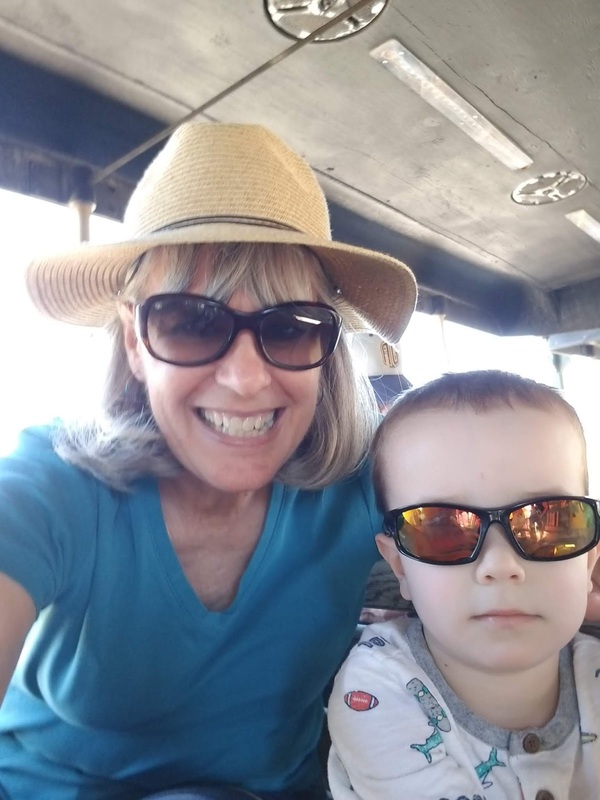 Yes, I missed this fun Wednesday get together but I was so busy playing with our almost 4 year old grandson and enjoying our son and DIL that I gave not a thought to my desk. In fact, I didn't spend any time at my desk from early Monday afternoon to Saturday afternoon! But Monday I cleaned my desk a bit and yesterday I started working on the class kits for Friday. So, here I am today joining up with Julia at the Stamping Ground and all the gals and sharing my desk. Middle, my paper trimmer with the beginning of the first card kit and a carrot box die just to it's right. Right, paper to be die cut next to my Platinum machine with my ATG adhesive runner needing to be moved. Just a short time after this picture I had 6 garden fences die cut with 1 to go. If I only have 6 in the class I make 7 kits as I use 1 kit to show what to do and it gives me some cards to send. I will share this pic of me and our grandson. Usually when he sees a camera he gets real goofy and makes funny faces. We're riding a train at Old Tucson and he started out jumping around but as the train started to move he got serious and started asking oodles of questions and really watching the scenery. We ended up riding the train again a couple hours later. We all had so much fun!!! We also spent some time at the Pima Air & Space Museum. Our little guy was in 7th heaven with all the planes, helicopters, and more! Well, that's this week and a bit from last week. I hope you head over to the Stamping Ground and check out the links to many desks! I love a fun train ride. Sounds like a grand day out. What fun! What a lovely pic of you and JoCool Carol! sounds like you had a fab week; I always think if you aren’t hankering for a bit of desk time, then you are definitely having a good time! That green cutter bed sets off all the other green pieces on your desk...even the scissor handles pop! Good luck for Friday, hope the kit cutting isn’t too tedious. Ah Carol, what fun, with Mr Cool to sit next too on a train no less! of course desks don’t rate. Glad you had such a grand time with him, I love your green cutter, it’s great! As are are all other pops of green how colour coordinated!